Discover the new taste and look of the easy to cook sponge cake which could be the ultimate party cake for any festival whether it is Birthday, Christmas or any other. 1. Preheat the oven at 180 degree C. Grease the aluminum cake tin with little butter and dust some flour. 2. Take a bowl and break eggs into it. Add vanilla essence into it. Beat well with an electric beater for 8-10 mins. 3. In another bowl, cream together butter and sugar with electric beater till fluffy or at low speed for 2-4 mins. 4. Add baking powder and flour into cream mixture and stir it continuously. Also add the half of the beaten eggs. Mix everything properly. Add the remaining egg and mix well. 5. Now add milk and stir it very well. If possible beat the whole mixture again for 1-2 mins. 6. Pour the mixture into the greased cake tin and keep it in the oven. Bake it for 25 -30 mins. Remove from oven and keep it stand for minimum 15 mins. 7. Now in a bowl whisk the white cream and spread it on the cake. Spread the cream equally and evenly on the side and top of the cake. 8. 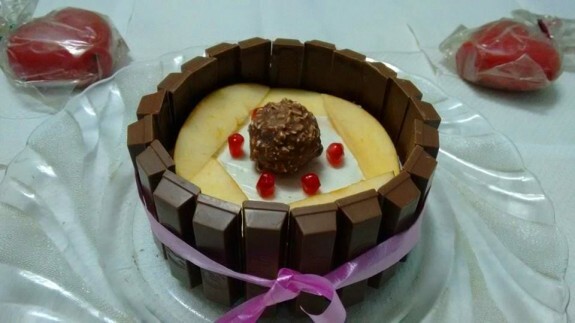 Cut the apple in thin slices and decorate it on the top side of the cake. 9. Now place a chocolate ball on the top middle and some pomegranate seeds on the side of the chocolate ball. 10. Now place all the chocolate Kit Kat bars on the side of the cake as per the picture to cover the cake from the side. 11. Tie the whole cake with ribbon. Note: You can do the same decorating process with any base of chocolate cake too. Also, you can use strawberries instead of apples for the decoration.